Dear business owner, is your PPC campaign optimised for mobile? More people than ever are ditching their desktop computers to access the web, so if your website and PPC campaign is not yet optimised for mobile, it’s time it was! As eCommerce sites and social media networks become increasingly easy-to-use on smartphones and tablets, more people are shopping on the move. But how do you know if your Pay-Per-Click (PPC) campaign is optimised for mobile? 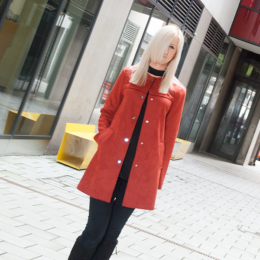 As a PPC agency in Manchester, we know more than a thing or two about creating original PPC ads that stand out alongside your competitors. Chances are, the percentage of mobile visitors to your site has steadily risen over the past year or so. 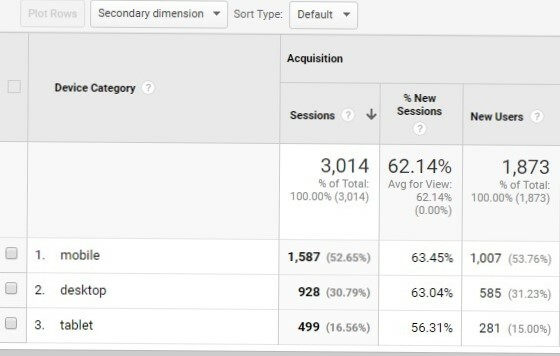 To find out if mobile optimisation is something you should consider, check what device visitors are using to access your site by opening Google Analytics and going to Audience > Mobile > Overview. Something I find helpful when viewing data is seeing it in pie chart form. As you can see from the above diagram, more than half of this client’s web traffic is from mobile! Once you’ve figured out what device types are being used to access your business website, you can make an informed decision about whether PPC mobile optimisation is for you. If you’re unsure or you’re completely new to PPC marketing, this blog post will help you! In 2016, Google announced it was creating a separate search index just for mobile. The company said this would become Google’s primary index (over desktop) and be more frequently updated. This change reflects consumer search behaviour, as more of us opt to use our mobile devices to search for online products and services. With this in mind, taking a mobile-first approach to your website is highly recommended (and a great way to safeguard your site for the future). You don’t need to create a separate mobile-only site to be mobile-friendly; if you have a responsive web design (RWD) you already have the ideal platform to make your PPC campaign successful. Read on to boost the performance of your Google AdWords Pay-Per-Click campaigns – no matter what device your ideal customer is using! The first step to a highly successful PPC ad is relevancy and usability. 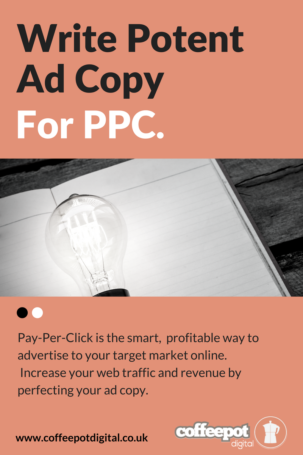 A PPC ad that directs a visitor to a page that isn’t relevant will drive your cost-per-click (CPC) up and ruin your chance of making any profit with Pay-Per-Click advertising, because nobody wants to be taken to a page that has nothing to do with what they wanted! If your pages are irrelevant, visitors will be frustrated and your bounce rate will go through the roof. To generate profit from your ad and enhance the customer experience, create a landing page that correlates to a user’s search query to strengthen your PPC campaign. You should ensure that visitors can easily navigate your website on a smartphone and tablet, too, and carry out any action they desire (such as purchasing a product) as easy as they would be able to on a laptop or desktop computer. Make forms that need to be completed short and as simple as possible, and if you’re able to, enable one-click payments to make the transaction process as straightforward as it can be! Another way to boost your conversion rate and make your site mobile-friendly is to speed up pages that slowly load. The faster your site loads, the less frustrated a mobile user will be (and the less likely it is that they’ll leave). Once you’ve made your landing page suitable for mobile use (test how mobile-friendly a web page is here), make sure people know! Mobile users who read your ad on Google search results (SERPs) will be more likely to click on your ad if they know it’s mobile-friendly. The simplest way to share this information is to feature the term ‘mobile-friendly’ somewhere in your ad (it could be in the URL, for example!). 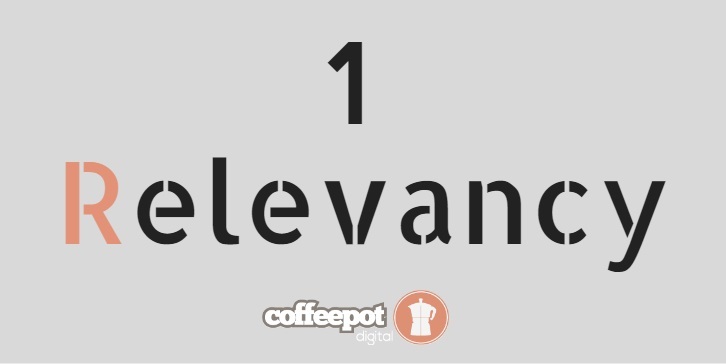 Of course, you don’t have much space, so get to the point quickly (and remember to keep it relevant). If you sell a product or service, entice your audience in any way you can – you might offer free UK delivery, or offer 50% off! To find out more about writing ads to get better results, check out our PPC copy infographic. Ad extensions are a fantastic way to stand out from your competitors and make an impression on your audience. There are lots of different types of (manual and automatic) extensions you can use, including: call, location, seller ratings, sitelinks, social extensions and more! Extensions are especially helpful for mobile users as they often find it more difficult to navigate to specific pages on your website to find information (such as the company’s phone number or address). If they’re on the move, they may not have the time or patience to browse your website for the appropriate information. Let’s take a look at some ad extensions in action. 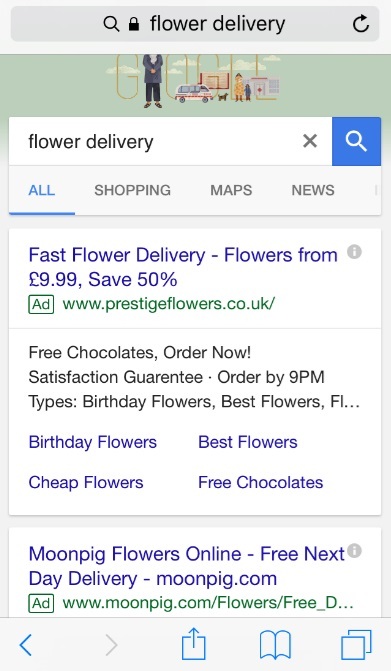 These paid search results came up for the search phrase ‘flower delivery’ on desktop. Which ad would tempt you to click on it first? Moonpig is still advertising Valentine’s Day roses, which would’ve been effective a couple of weeks ago, but it’s now March! Even if I were to consider buying roses, after reading this ad copy I’d be questioning whether ‘Free Valentine’s Day Delivery’ was still available now that the holiday has been and gone. Still, it’s not all bad news. The ad extension showing their 9.5 customer ratings does give me some confidence to shop with them! 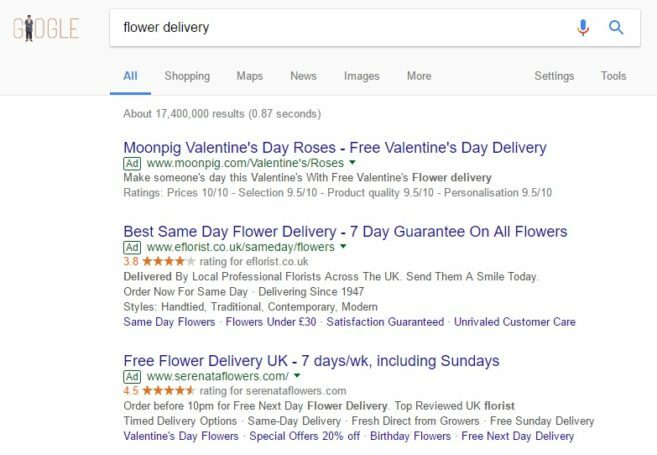 eFlorist does much better with sitelink extensions, and their ad is more relevant to the original search query, ‘flower delivery’. Find out more about different AdWords extensions. Note the top position (above the fold) is obviously where you want to be to get the most visibility (only 3 ads show on mobile, and there are no Google shopping ads on the right). So how can you gain a top mobile ad position? If you find your conversion rate is higher from mobile devices, it’s obviously important that your ads have maximum visibility on mobile. To gain top ad positions for your keyword-rich ads and boost your performance, you need to pay attention to your Ad Rank. So, what is Ad Rank? Ad Rank is ‘a value that’s used to determine your ad position’, which can fluctuate depending on your competition at that moment. It can make the difference between being positioned first, third, or not at all. Ad Rank is calculated by multiplying your maximum cost-per-click (CPC) with your Quality Score (Max CPC x Quality Score). Gain a top position on Google AdWords and increase your revenue with professional PPC management and support. 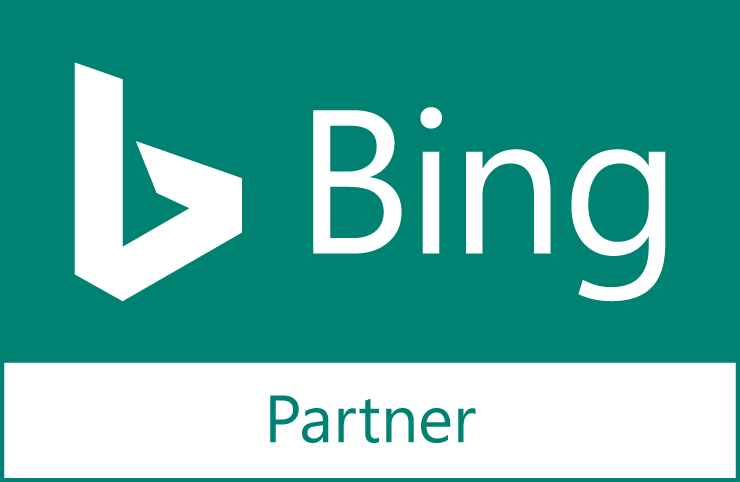 We have years of experience offering PPC services in Manchester to businesses nationwide. Grow your business with PPC; call 0161 236 0390 today.